I have a great love for all things Glutino. They haven’t let me down yet, and I’ve been fortunate enough to pick up quite a variety of their product offerings over the past couple of years since I had to go gluten-free. However, while I have enjoyed everything I have tried thus far…I do have to say…they make the best damn freakin’ gluten-free pretzels on the market. From the first time I tasted one of their gluten-free pretzel twists…what seems like ages ago…I was hooked. Addicted. Ready to enjoy way more. I might have a sweet tooth, but that craving for something salty is also a constant thing in my life. I enjoy both…for different reasons. (And lucky me, Glutino makes amazing chocolate covered pretzels…which brings me the best of both worlds). But recently…it’s been the salty side that has been winning. Lucky for me, a little while back, my roomie made a dash to the grocery store for me while I was making dinner or something and was lacking an ingredient. While there, she surprised me with a gift. She picked up a bag of Glutino’s Gluten-Free Pretzel Chips. I had other items in my pantry to work through first, but these got their moment to shine today…at my scheduled snack time. And, boy…was I not the least bit disappointed. Glutino bills the Gluten-Free Pretzel Chips as something you can pile high with cheese, veggies, spread with paté, load up with savories, or use to scoop up dip. So…a chip but in pretzel form. Hence…pretzel chips. HA! Anyway, I chose to eat mine plain this morning…not having any amazing hummus or dip of some sort to use these with…but…it didn’t matter. Even on their own, the Glutino Gluten-Free Pretzel Chips do not disappoint. Not one bit. Just like the Glutino Pretzel Twists and Sticks that came before…these also carry that unique and so completely drool-worthy buttery flavor in each bite. That is my favorite part of crunching into a Glutino pretzel product. Nothing tastes better than that little hint of buttery flavor. Sort of like eating a crunchy and gluten-free version of an Auntie Anne’s pretzel. They are fantastic. Not too much salt – just enough to give each chip that pretzel seasoning that you desire. You gotta love that rich flavor with each bite. And the crunchiness is so good. No soft bites here. These are fantastic!! I’m addicted. No…seriously…I might need an intervention. 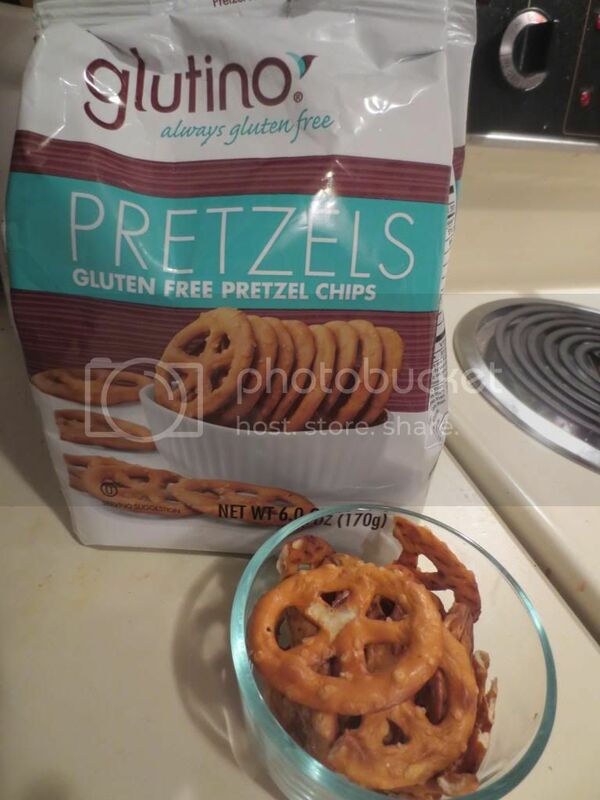 As far as ingredients go, Glutino Pretzel Chips are made up from corn starch, potato starch, rice flour, soluble corn fiber, palm oil, salt, cellulose gum, sugar, cellulose powder, soy lecithin, yeast extract, sodium bicarbonate, citric acid, sodium acid pyrophosphate, onion powder, and garlic powder. They are, as always, completely gluten-free and cholesterol free. Nutritionally speaking, a serving of the Glutino Gluten-Free Pretzel Chips is 30 grams (or about 11 of the chips). This serving will provide you with 120 calories and 3 grams of fat. In addition, this serving has 400 mg sodium and 3 grams of sugar. These provide 3 grams of fiber, but no protein. But…they are a snack. And a delicious one at that. So, keep that in mind. Hit the store, seek these out and indulge. Enjoy. And try not to eat the entire bag in one sitting. It will be tough, I know. BELIEVE me, I know. Super good. Super crispy. Super WOW!! Glutino…you win again! This entry was posted in Dips, Food, Gluten-Free, Hummus, Pretzels, Products, Review, Snacks, Spreads, Vegan, Vegetarian by The Celiathlete. Bookmark the permalink.